Notes: Very rare immigrant (less than 10 previous UK records). 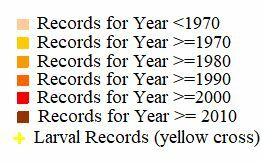 Most of the inland records probably refer to adventives, however several coastal records including those at Mawnan Smith, Cornwall on 15/16 August 1983, one at Swanage, Dorset in 1991 and one at Bradwell-on-Sea on 12 August 2004 probably relate to primary immigration [Goater]. Not recorded in Hampshire or on the Isle of Wight to date. Wingspan 28-34 mm. Unmistakable. Larva feeds on various Leguminosae, causing sufficient damage to be a serious pest in some areas, no evidence of breeding in the UK.